Earn 2450 loyalty points when you order this item. 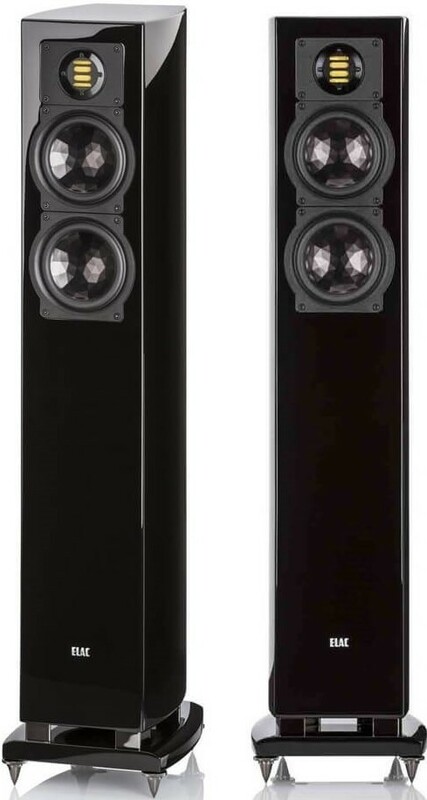 Elac FS 267 Speakers (Pair) is the slender floorstanding sibling of the compact BS 263, a 2½-way, bass-reflex design with a convex curved cabinet that fits discreetly—almost organically—into listening rooms of any size. 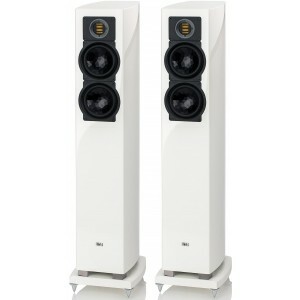 Close your eyes and be captivated by delightfully neutral sound and effortless performance. From the deepest lows to silky highs and everything in between, the FS 267 never misses a beat. The eye-catching surface of the crystal membrane is more than just an attractive design feature. Drivers in the Line 260 employ the Crystal Membrane (patent pending) and their design is based on ELAC’s Aluminum Sandwich AS Technology. The crystal-shaped inverse Aluminum dome is joined to the paper cone in a special gluing process to result in the desired sandwich construction. Resembling the surface of a large crystal, the Aluminum foil stamping stiffens the Aluminum dome, diminishing resonances and minimizing colouration, while improving power handling and dynamics. The voice coil design of the drivers results in an expanded frequency range, and driver surround allows for longer cone excursions for truly prodigious volume and lowest distortion, a unique engineering achievement for a driver of its size. 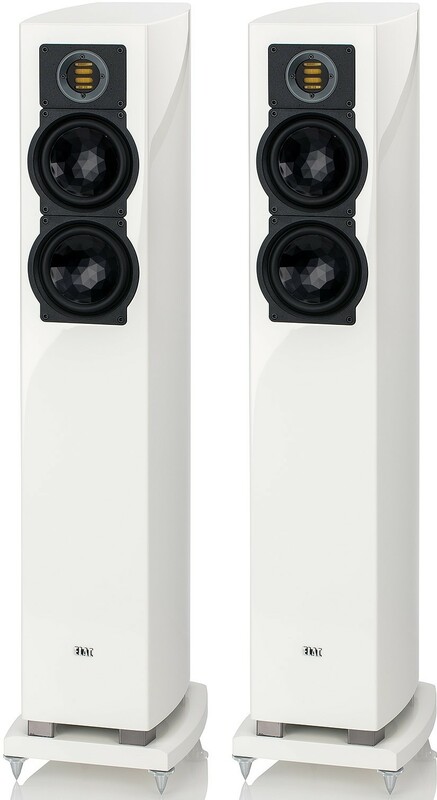 Delivering true high-definition sound, ELAC’s JET 5 tweeter enthralls with its lightning-fast response and wide dynamic range offering minimal distortion, lots of headroom and a distinctly wider frequency range than conventional dome tweeters. The ELAC JET tweeter is one of the most legendary tweeters in the industry and has won international praise with its transparent and effortless sound image. The JET tweeter was developed to perfection on the basis of the famous Air Motion Transformer by loudspeaker pioneer Dr. Oskar Heil. It is based on a concertinaed-foil membrane, driven by a strong magnet system of neodymium rods. This motor drives the air considerably faster than the pistonic motion of a conventional driver, with gains in higher sensitivity and extraordinary dynamics. Due to many additional design changes, like an improved new neodymium magnet system, even higher efficiency, higher sound pressure levels and frequency response up to 50kHz was achieved. The core of the JET tweeter is the folded foil membrane. With a fold width of only 0.84mm, a major requirement in the JET production is precision. To guarantee repeated accuracy and unchanging quality even with high production capacity, gluing and handling are now executed by two SCARA robots. The folding and fixing of the membrane, however, is executed by hand, since the manual dexterity of skilled technicians is irreplaceable. Due to continuous improvement, the JET 5 tweeter creates an effortless, airy and resonance-free image up to 50,000Hz and with a linear frequency response ideally suited for the reproduction of DVD-A and SACD. All Line 260 speakers are equipped with a fabric grille that is attached only through the force of magnets hidden beneath the surface of the cabinet. Listeners who prefer to look at their speakers and listen without a grill will appreciate the clean design and uninterrupted surfaces of the impeccable ELAC cabinetry.